Keith Curle says he will continue to make regular changes to his Cobblers starting line-ups, declaring he will ‘stick to what I believe in’ when it comes to football management. The Town boss has been criticised by some supporters for his constant tinkering with the team, and happily admits he has yet to name the same starting XI for consecutive games since he has been at the club. 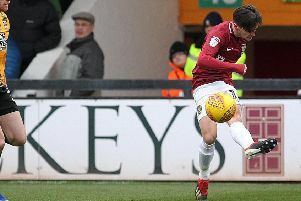 For Saturday’s 4-0 defeat at the hands of Colchester United, Curle made four changes to the side that had drawn 1-1 with Morecambe the previous weekend with deadline day signings Marvin Sordell and Charlie Goode going straight into the starting line-up and John-Joe O’Toole and Shaun McWilliams returning from injury. Town are back in action tonight (Tues) when they travel to Tranmere Rovers (ko 7.45pm), and it is highly likely there will once again be changes as Curle strives to find that winning formula. Asked if he understands some supporters’ frustrations at the constant changes to the Town team, Curle said: “Yes, massively. “I do understand that frustration, but within that I am not scared of change. “If we go out and we win 3-0 or 4-0, and all the players in the team perform how I expect them to perform, the likelihood is that I would potentially keep the same team. “But if there are elements in games that I think we can improve with a change in personnel, then, as much as it might upset some people, I will do what I think is the right thing. “I don’t have a fear of upsetting somebody, I have a a fear of not doing the job how I think I want to do it. “I won’t let myself down by saying ‘I wanted to do that, but I didn’t’. Changes are certainly expected at Tranmere after the weekend’s heavy loss to the U’s, with the final whistle signalling a loud chorus of boos from the Cobblers faithful who remained to the bitter end. Curle says he can understand that people aren’t happy with how things are going and in particlar with Saturday’s defeat, but believes the majority of the club’s supporters can appreciate the bigger picture. “I think the majority of supporters will have been disappointed by the result, which I can understand,” said Curle. “But within that, I think they will have understood as well that if we had taken the chances we created at those key times, it would have been a completely different game. “If we had been rolled over and been on the back foot from the first minute, and we were being cut open left, right and centre and not posing a threat at the other end. “If that had been the case then the grumblings would have been well justified, but we have good chances at key stages that would have changed the outcome if we had taken them. “I spoke to their manager (John McGreal) after the game, and he reiterated that his players had been clinical at the right times and took their chances. “We did the same against Carlisle the other week, as statistically in that game there was nothing in it, but we ran out 3-0 winners against a team that was fourth in the table at the time.